I know as a home blogger, I’m supposed to crank out awesome new holiday projects weeks before each season starts. Well, I honestly don’t do a lot to decorate for the seasons. I like to throw out a few natural elements…like sea shells in the summer, a few eggs in the spring, some evergreen boughs and pine cones in the winter and I’ll buy a few pumpkins for fall. So far, I bought one pumpkin at Wegman’s the other day and plopped it in a dough bowl. Done. I’ll probably pick up a few more as I see ones that I like, but that’s really about it. I already had some feathers in an ironstone pitcher and those look fall-ish, so I moved them up to the living room to give them a more prominent place. The times when I do actually do a project, it’s almost always for an HGTV freelance article and usually I’m doing it after the holiday has passed or in some random month like April. Most pumpkins I acquire are for free when people are ready to decorate for Christmas. … and foam tomb stones. Here’s the thing. I’ll make them, set up the photo shoot and then I end up selling most of the projects and props or dropping them off at the local thrift store. I’ve kept a few of my very favorite to use for future shoots, but I really don’t decorate with them. I’ve always loved the idea of decorating for all of the seasons and homes that have seasonal decor beautifully arranged on their porch look so inviting. My porch has empty concrete urns and cans of Verathane that I need to list on Craig’s List. I think the thing that prevents me from going all out is that I would rather spend time upholstering a piece of furniture that I can use all year or put my money towards some paint or a rug. I don’t want to buy a bunch of stuff that spends 11 months of the year in bins in the basement. My only exception to that is Christmas decor, but I don’t get too carried away with that. My point is this… in this Blog/Pinterest world, it can sometimes feel like we need to do all of that or we’re somehow falling short. If you’re just throwing a few pumpkins on the porch, just know that I’m right there with you. And if we’re falling short, I’m sure we’re in good company. Well …you could change the table runner to black. Thanks Marion for confirming that we don’t have to do it all! And there is no way we can! There are some years I just don’t have the time to do the full on seasonal decorating thing. We used to decorate full on for Halloween. But, as our son has grown older, the interest has slacked. Unfortunately, last year a couple of trick-or-treaters commented on our lack of decoration! We may have to do a little bit more this year! Lol! Ahh! A breath of fresh air! I’m glad I’m not the only one. It’s usually well over 100º here for quite some time. This isn’t fall for me. This is summer. I want to embrace the season that I’m in where I’m at. The leaves don’t fall here until after the first frost, which is usually 10 days before Christmas. They don’t really change color much here, usually, because it is cold that causes them to change, and we don’t get much of that. I don’t want to decorate with fall leaves right before Christmas. I have bought a few small pumpkins in the past to put out and this year I tried planting miniature white ones in the front yard so that I would have some, but it’s still too hot for the plants to make female flowers, so I don’t know that I’ll get any pumpkins in time for Halloween (I though they would be nice up the walkway to the front door at night, growing on their vines); perhaps we’ll get some in time for Thanksgiving. But then after Thanksgiving the Christmas decorations go up. Like you, that’s the one season for which I like to decorate. Love the white pumpkins with the greenery! Elegant but still festive. Nicely done. As my kids say just do you, good advice I’d say. That white table is making me swoon Marian. How in the world do you keep coming up with such gorgeous ideas. I think I would pop a vessel if I had to do what you do. Beautiful photos! I love your silverware, too. Very sweet and cute. I love the seasons, and I love decor for them, but the more I hone in on my personal style, the less I like the idea of it in my home and the less time I have for it. We’re usually so busy preparing things for our booth that the homefront gets neglected. I throw wreaths on the doors and a token item or two in the two rooms we hang out in most — the kitchen and family room. The older I get the more fun it is to enjoy everyone else’s decorations via Pinterest. I’ve never commented on your blog before but this post completely rang true for me. Several years ago my husband and I decided to “scale” back our holiday decorating for this exact same reason and I have not regretted that decision for one minute! Not only do I have your same philosophy that it only gets used for one month when I can use that same money for something that will be in my house all year, but it takes away my “holiday” stress and allows me to focus on children and the reason for the holiday. It made me feel like I was not alone in wanting a beautiful house, but without all the stress of “redecorating” for each holiday! You are the BEST! I’m the same way. I look at boxes of decorations and just see work. Work to put it up and even more work to take it down. I already don’t have enough hours in the day. Holidays are just as fun without all the shelf litter. You are too right! The stores are already wacky with the overlapping seasonal things and blogging can REALLY put the pressure on to conform. I do minimal decor as well and it gets more minimal the older I get! Christmas is my one big holiday and even that is getting less and less. Amen! A few year ago…I got so tired of packing & unpacking all the christmas decorations…not to mention storing them for 11 months…I sent it all to goodwill, then I felt I could breathe again! And hubby asked yesterday if it was too early to set up our outdoor fall display…which consists of cornstalks and pumpkins….maybe this weekend…if the weather stays cool. I grew up with a mom who decorated for EVERY holiday/season even Saint Patrick’s Day and Valentine’s Day. I definitely did not get that gene. We do Easter Baskets for the boys and I usually end up “pulling them out” the day/night before. I’ll be lucky if I have even one pumpkin for the fall season. I’ll admire my neighbor’s fall displays and your photos of “staged” holidays;-)! Love your table with the pumpkin in the dough bowl. I was on the hunt for white pumpkins this weekend and found my first Grey one, I am in love with it! I think it just may plop on my farm table with a few feathers and an old grainsack, perfection! I used to do the whole thing all over the house, and still may decorate with lil spooky things here and there, just to remind myself of when the boys were little….! Happy Fall!! I’m more of a summer/winter decorator. In Fall I like to bring in cozy throws, pillows and maybe a few natural fall elements like a pumkin or fall branches. In Spring I’m all about fresh flowers, potted plants and open cleared off surfaces. I think you have a beautiful “fall” home! I like the simplicity of your decorating and especially love the use of things from nature. thanks for this…as a relatively new blogger, I feel I am always behind the eight ball trying to get things done to post. With no small children in my home, I don’t really decorate much for things like Halloween, but now I’m feeling the pressure…thanks for letting me know I am in good company and not a bad blogger for not decorating my home to the nines for each and every holiday! I am such a slacker that I still have my red, white and blue wreath on the front door…since the 4th of July! Every time I see your styled set ups and images – I am inspired! Thank you for sharing this post. A creative resource for all – as always. Love that you say this! When we moved to Florida from Virginia 14 years ago, I couldn’t get into fall or Christmas decorations anymore. I tried decorating a potted palm, but it had insects and I had to throw it out before the 25th. No basement, either, so no more decorations. Thanks for validating me! I am completely the same way! Our extreme is that we now have two trees. One is the family tree with the gifts and all the kids ornaments. And one so I could create “my” tree, which fell together beautifully with a few years of clearance choices and family portraits in small gold frames. What amazes me is that when it all came together and I got the tree, it matched the room in our newest home perfectly! I have tried to add more “stuff” in the past, but find it starts to look cheesy and is just not me. I like things in natural colors, simple, and do have some essentials. I do the wreaths–now just green with spent magnolia buds and burlap ribbon. I just really hate to much stuff and it not flowing with my daily decor. I can’t imagine the whole “remove everything from your tables and curio cabinets” to replace with Christmas decor and spend a month putting it all away! I have walked into “Nutcracker” ROOMS, tables cleared for sets…all meaningful to those who do, but not me. I LOVE your white pumpkin with the name tag at the place setting and the greenery and pinecones at the base of the pumpkins. I’m right with you. I move into each season somewhat gradual. Some folks pull off extravagant decor but sometimes it’s more like a holiday is puked everywhere. I suppose I follow nature and as it begins to turn to a new season so do I. I am also a believer in less is more but all in all whatever is brings a smile to a persons face is really alright. I do love the table runner with the green and beige; I bottomed a straight back chair with the same stuff in red. I’m always inspired by you interior creations. Have a wonderfully creative week! So classy! Less is more…I’m in love! I think less is waaay prettier. I hate clutter! Let a few things stand out. I too love a few natural things. I have curly willow branches in an old milk crate and I am going to buy a few small pumpkins/gourds and thats it. So much easier! Right there with ya’ Miss M!!! Amen Sista! You make me feel so much better about myself, by just being you! I am always worried about being behind on everything. I spent all of July in the hospital with my mom and still trying to figure out where the summer went. I go into the store and Halloween decor is on sale and the Christmas decorations are coming out. I’m so busy with work and life that I don’t take the time to do much decorating my own space either. I completely agree. I hate to waste money on things that are going to rot or die which would be any live thing I put on my porch. I’ll get a couple of pumpkins and a mum or something but I can’t spend hundreds of dollars on stuff that I’ll either forget to put out or will spend more time in a bin than not. I’m glad somebody said it because all of the pretty pictures do make you feel kind of guilty. Now I can absolve myself. A little bit anyway. I no longer buy the old fashioned orange ones anymore.. my Amish neighbors have a huge pumpkin patch and grow all sorts of varieties. I think I drive them nuts when I go down because I am so indecisive. You’re doing just fine! Sometimes less is more. I am a seasonal decorator…….I love it. Your mini pumpkin wreath is live on HGTV and I can’t wait to make one! I am getting putka pods as soon as I can! Thanks for the chuckles! I don’t have a porch yet at our current house, so hanging something on the door is all I can do, especially when the snow comes. Sometimes decorating does seem like work, as the other posters have said. I’m glad I’m not the only one! 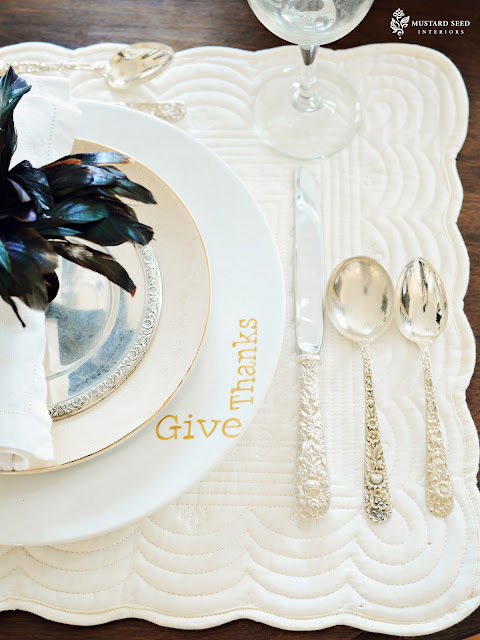 Love the white thanksgiving photo, especially the silverware. Love the white Thanksgiving table! It looks so elegant yet rustic. This means a lot to me. In the last year I have been diagnosed with cancer and had my marriage dissolve. I am blessed to have come through both but full-scale seasonal decorating has lost all its appeal to me. What has not gone away is my love of creating a welcoming home and I’m realizing that is the essence of what decorating is. It is the ornamentation of the celebration of home and all it means to you. If one pumpkin is adornment enough, then there you have it. You’ve confirmed what I’ve come to learn. I am so glad you wrote this post, I think that it validates so many women. You are such a source of inspiration for many. I was surprised, scrolling down and looking at your photos to see a place setting using silverware that so closely resembles a beloved spoon I have. It is encrusted in flowers, just like these. I have never seen any others- the one I have my aunt gave me when I was little and we were cleaning out her attic before she moved. Could you tell me a little bit about yours? Thank you! Phew! I feel so much better after reading your comments on not decorating for every season/holiday! I too just put simple pieces out and do a bit more for Christmas but even then lately i’ve struggled to get a tree up and decorated days before the holiday! I’m slowly leaning to do the things that make ME happy and that fit into MY busy schedule not others! Oh, I’m so bad! No decorations here… even Christmas. Just me and my doggie. I asked and she said she didn’t care one way or the other ;/…. The tiny pumpkins!!! Did that take a frillion hours or what??? Pretty cute. Won’t copy that one for sure. My husband’s aunt willed us the exact vintage silverware!! (S. Kirk and Son). I’ve never used it but kept it in a drawer all wrapped up. You have inspired me to get it out and start using it…it is such a lovely set. Marian, it was as if you were writing down my thoughts about how I decorate. I love the natural elements used in home decor as you do…pumpkins (the more unique or different, the better), thistles & decorative grass stalks from the yard, or even branches. It was exciting to see you mention Wegmans since I live in central New York where they originated. We have one less than one mile from us and its about the only place I shop besides BJ’s. Does your store have the huge mum plants for $7? They are even cheaper than WalMart for the size! Enjoyed the beautiful pictures, thanks for sharing! Marian, I’m right there with you. I have a very few things I put out every year in September, and they stick around until the Christmas comes out after Thanksgiving. Silk florals in fall-ish neutrals (which were handed down from my mother), a rag-garland I made a year ago from a scrap of fabric I’d been hoarding for 8 years, a few painted pumpkins I’ve either inherited or picked up at the Dollar Tree because they were cute. Less is usually more. While I’d love to deck out my porch with corn stalks and hay bales, with a cute ladder, wagon and piles of pumpkins, it’s just not feasible. Nevermind that my boys would be physically unable to leave stuff alone. It’s expensive and time-consuming. And I’d just much rather make something that’s going to last. Like the projects I’ve got going right now for the boys’ bathroom, and (gasp) the front porch. Thanks for always keeping things real. Because as much as we’d like to convince ourselves otherwise, Pinterest, she ain’t real! Boy, Marion, I was so happy to hear you say that you don’t do much holiday decorating. My husband and I downsized by more than half of our big house, when our 2 daughters moved out. We have been in our new place for 3 yrs on, 12/24/10. Talk about stressed! All I put up now is my Nativity Scene. I do change the wreaths on the door for every season. We have been doing a much toned down Christmas, I believe ‘Keep Christ in Christmas’, not a Santa Claus Christmas, a real Christmas. Every year as fall approaches I have this huge desire to go whole hog with decorating my front door for fall. Like pumpkin towers, bails of hay, tons of mums, new wreath, etc. But then I start counting up the ten’s of dollars it would take to do that all, for only a month? I have to make myself pass 🙁 Usually just a mum or two and a pumpkin to carve for Halloween. But the pressure is always there to do more . . .
Miss Mustard…I hear you! I am so busy now and through the holiday season…I barley can get Thanksgiving dinner made. I always say I am going to pump out trees early…so I can decorate, but that is Never the case! I love your white pumpkin and your photo shoots! Keep the lovely ideas coming! Thanks for sharing and these pics are lovely, but I am definitely a decorator such as you – guess the old addage, less is more is correct. Love your posts! I like to reuse my decorating seasonal stash in different rooms. It is nice to see how to incorporate fall items but to me they must be natural and nature does that best! Thank goodness I’m not the only one!! I’ve been seeing all of these decorations and I’ve started to feel guilty. Christmas we spend with our children because they all live in one city and we live two hours away. So, we don’t decorate a lot for the seasons because it is so much easier to transport “us” than to make them come to our house. We do have Thanksgiving but they love what we cook and they bring their own containers for left overs. I don’t think they pay that much attention to the decorations. It is all about Family and Food!!! Well said, Marion. You have generously shared with your readers the freedom to focus on the joy of the season itself. Most of us live in our homes so it’s never perfect. Besides that, simple is always classic. I love the pumpkin wreath! So it will be for sale in your store? I used to go all out for Christmas, but have started scaling back. Not much fun packing it away for days anymore, then trying to remember where I stashed the everyday decor items I took down for Christmas! I used to change wreaths for the seasons too, but we installed a screen/storm door this year, and my wreaths won’t fit between the space anymore! Never did much for Halloween since my girls grew up, but hubs still wants Jack o’ lanterns – and I have to carve them – hate it! It’s nice to be free of all the packing and unpacking, searching thru totes to see what I feel like putting out that year. But I can’t seem to part with the stuff I don’t use! Keep hoping my girls will want some for sentimental reasons – so far, it’s a no! Looks like we have a consensus here. I never did a lot because I just didn’t have much time or money. Like you, I had to prioritize what I wanted to do with my resources. Then I lived in Texas 8 years, and there is a whole different mindset there — or least there was then. Everybody turned the house into Disneyland every single holiday and season. Now that I am practically in my dotage and have downsized, life is simpler — with more organic components and more emphasis on the meaning of the seasons. I do remember that the good china and table cloth (more like your white Thanksgiving) were the norm for special occasions. We didn’t have 500 sets of “stuff” — and I am planning to weed out a whole lot of mine over the next year. Thank you thank you for saying that about seasonal decorating!! I sometimes feel that I fall short in that area. I just don’t have enough time and would rather spend my money also on other decorating things. If I do decorate, I like to use things that can stay up through Halloween and Thanksgiving. I’m right there with you Marion! I have the same thinking about buying things that are on display for a short period of time versus something I can enjoy all year long. So yeah, a pumpkin or two sounds about right to me. I love simple, clean lines in decorating and dislike having a “overdone” look. While I love to change out my décor for each season, I try to keep it at a minimum. As I have gotten older, I realize that less is more. Here, here! I do enjoy the photographs and creativity of others’ holiday decor, but that’s as far it goes. I’m definitely more on the minimalist (and naturalist) side of holiday props in my own home. Simple is beautiful in my cottage. Thanks for this simple and honest blog. Much appreciated. Thank you for being so real! Love that and love your blog. New subscriber to your blog! Love it! Great post, good to see I’m not alone! Thank you Marian!!!! 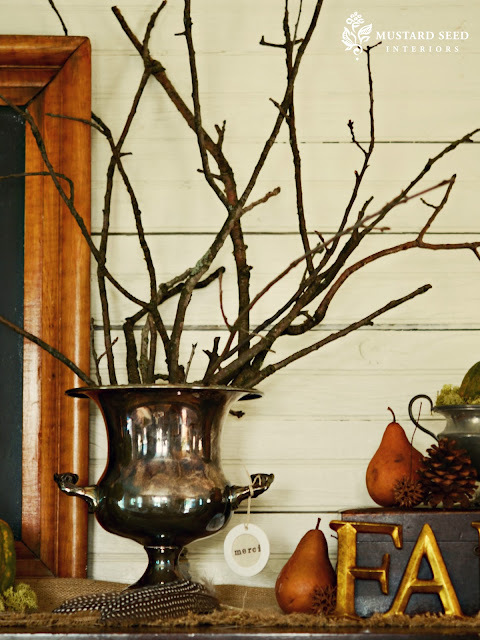 I see all the porches, mantels, buffets and tables beautifully decorated for each season/holiday, then I look at my home and think yuck that will never work in here…so I do just a couple of appropriate items for whatever season it is. I always feel like it is so inadequate. I’m so glad to know I’m not alone with feeling like there is no need to go over the top with each season! Sometimes simple is the best! Thank you for sharing your beautiful home and your beautiful spirit! I am very minimalistic too when it comes to decorating for the holidays.I hate rearranging my home around to put out holiday decor.I used to go all out when my daughter was small.And now I just keep it simple.I use simple elements.For fall pumpkins,acorns,apples and pears are part of my decor.Along with dried hydrangeas and fresh flowers from my garden….that’s it! Once I migrated my decorating toward ironstone, vintage china and less color and jazz, I found seasonal decor MUCH easier! It’s so easy to add just a few simple things to what stays out all year. It took me years to learn this…I’m a slow study….but it has certainly made my task easier. You are brilliant and talented and generous, my dear. Thank you for sharing your gifts. So true, simple is more, and classic and natural is always in style & no waste. You are speaking to me today. I never decorate for halloween and I totally agree with your few eggs at Easter. Christmas is a little different for me as well, I enjoy it more than any other decorating. For the last 10 years I, along with a team, also decorate our church for every season or celebration and un-decorate when someone is getting married. I have come to this realization recently, that I prefer to do very little at home, and am going through my boxes and bins to donate, thrift or sell. In my humble opinion, simplicity is best. Beside are we decorating to impress others or to bless our family? Thanks for sharing Marian! I love the pumpkin, leaves, pinecones, and nut centerpiece. The use of upholstery webbing as a weaved runner is genius! Is there a tutorial for this somewhere? Yet you’re enthusiastic about making your house a home where your family and guests feel comfy as you gently remind them of the season without surrounding them with an overload to their senses. Let’s leave that to the home decorating divas who have huge staffs and who, if we’re not careful, can make us feel inadequate as we look at the one pumpkin and a few fall leaves on our dining room tables. AMEN! So so so glad to hear this! Oh yeah, I’m right there with you! I don’t know what to think … seems to me you are just supporting the propaganda about decorating–I mean why put the photos out there if that’s not you. Sounds pretty phony to me. Welcome to the REAL world! I live there too Marian. I do love a look at what you are doing for HGTV and magazines though. There are many who really love to MAKE the decorations and for them these projects are a great inspiration! Great post. Thank for being so practical and sharing. Could you please tell me the pattern of your silverware. I picked up one ice tea spoon with this same pattern from am antique store and would love to know more about it!